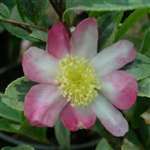 Small, single, scented, white flowers with rose pink tips to the petals, but the real attraction of this variety is the variegated foliage. The robust, dark green leaves with silvery-green margins enhance the display of flowers, while the young growth is a striking purplish colour before it matures. A vigorous, very upright growth habit, forming a dense bush. The help and information given to me could not have been improved upon. The shrub was excellently packed and delivered when promised - Amazon could not have done any better. Plant arrived in good time and excellent condition. It is the second time I have bought from Trehane. The plants have arrived each time beautifully packaged and in excellent condition. I would have no hesitation in buying from Trehane again.